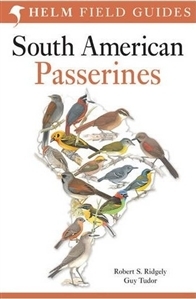 This is a single-volume guide to South American passerines, based on a two-volume work first published in 1989 and 1994. For the new edition, the text has been condensed, most of the missing species that were not illustrated before have now been painted, and brand new maps have been compiled for every species. This is a major identification guide to the songbirds of South America. No other single volume guide exists for passerines (though there is a single-volume guide for non-passerines from Collins). There are still large areas of South America without a comprehensive field guide, so this book will become essential for anyone birding in these areas (e.g. Brazil, Argentina, Bolivia, Paraguay and Uruguay).